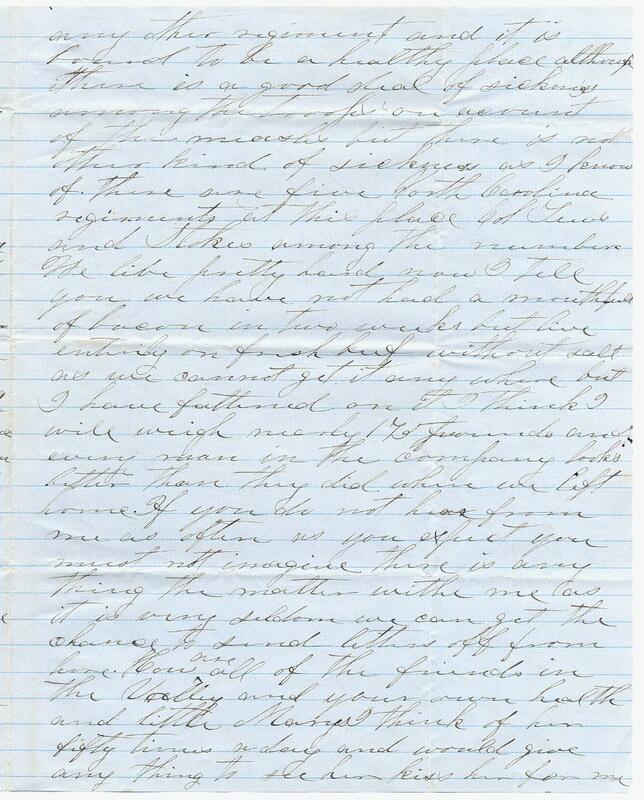 Item description: Letter from Private Walter L. Jones, Company A, 22nd Regiment, N.C. Troops (12th N.C. Volunteers), to his father, Edmund Jones in Caldwell County, N.C.
Edmund Walter Jones of Clover Hill, situated about six miles north of Lenoir in Caldwell County, N.C., was the son of Edmund Jones and his wife Ann Lenoir Jones of Palmyra. Edmund Walter Jones married his cousin Sophia Caroline Davenport, daughter of William Davenport and his wife Mary Lenoir Gordon Davenport of The Fountain (or Walnut Fountain). All of these homes were located in Happy Valley in Caldwell County, N.C. Edmund Walter and Sophia Jones had four sons and one daughter: Colonel John T. Jones, who was killed at the Battle of the Wilderness on 6 May 1864; Private Walter L. Jones, who was mortally wounded at Gettysburg; Captain William Davenport Jones, a member of General Collet Leventhorpe’s staff who was also wounded; and Edmund Jones, legislator and lawyer. Colonel John Thomas Jones served in the 1st North Carolina Volunteers and then as an officer in the 26th North Carolina Regiment under Zebulon B. Vance and Henry K. Burgwyn, and in the brigade of James Johnston Pettigrew. He was a lieutenant colonel when he was killed at the Battle of the Wilderness. Walter L. Jones attended Hillsboro Military Academy in 1860, became a soldier, and was killed at Gettysburg. Edmund Jones (1848-1920), called Edmund Jones, Jr. and nicknamed Coot, studied at Bingham Academy, served briefly in the 3rd North Carolina Cavalry in 1865, and after the war studied at the University of North Carolina and the University of Virginia. In later years, he farmed at Clover Hill, practiced law in Lenoir, and served in the N.C. legislature. Item citation: From folder 10 in the Edmund Walter Jones Papers #3543, Southern Historical Collection, Wilson Library, University of North Carolina at Chapel Hill. I would have written to you before but the mails all so uncertain that it is doubtful that you would have got it or not. There is no certain regular mail to this place. We are all well and in fine spirits and are spoiling for a fight. We are stationed about three miles from the Potomac river and some of our batteries firing at the Yankee vessels every day or two when they venture too far. We have the North Point gun which was taken at Manassas. They threw two shells on board the Pawnee with her yesterday and killed several. We are about fifteen thousand strong here under the command of General Holmes of North Carolina. I saw him today and he is a very hard looking case it would make the Yankees men [afraid] to look at him. We were inspected by him this morning and he sayed our was a very fine company indeed. 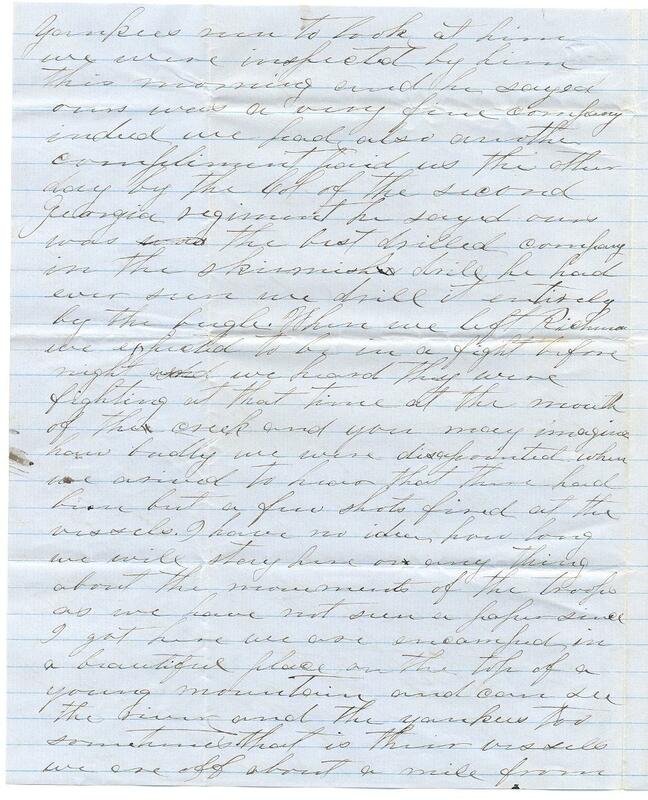 We had also another compliment paid us the other day by the Col of the Second Georgia regiment. He sayed ours was the best drilled company in the skirmish drill he had ever seen. We drill it entirely by the bugle. When we left Richmond we expected to be in a fight before night and we heard they were fighting at that time at the mouth of this creek and you may imagine how badly we were disapointed when we arrived to hear that there had been but a few shots fired at the vessels. I have no idea how long we will stay here or anything about the movements of the troops as we have not seen a paper since I got here. We are encamped in a beautiful place on the top a young mountain and can see the river and the yankees too sometimes that is their vessels. We are off about a mile from any other regiment and it is found to be a healthy place although there is a good deal of sickness moving through the troops on account of the marshes but there is not other kind of sickness as I know of. There are five North Carolina regiments at this place. Col. Tew and Col. Stokes among the number. We live pretty hard now. I tell you we have not had a mouthful of bacon in two weeks but live entirely on fresh beef without salt as we cannot get it any where but will weigh nearly 175 pounds and every man in the company looks better than they did when we left home. 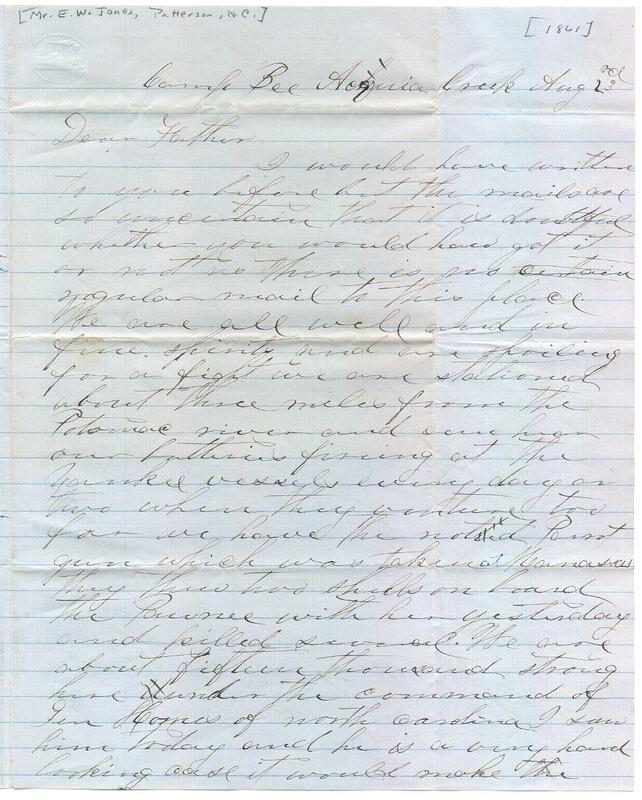 If you do not hear from me as often as you expect you must not imagine there is any thing the matter with me as it is very seldom we can get the chance to send letters off from here. How are all of the friends in the Valley and your own health and little Marys? I think of her fifty times a day and would give any thing to see her. Kiss her for me and tell her she must not forget brother Wat. Give my love to Will and Mary and tell them I would like to hear from them and know how they are navigating. I suppose they stay at Clover Hill most of the time. I hear that Coot has got entirely well. Give him my love and tell him he must make haste and get big enough to fight the Yankees. Also give my love to aunt Connie and uncle Finley and all of the rest who ask about me. Send love to all. PS Write soon and direct to Richmond VA Care Col. Pettigrew Co A 12th Reg N.C. Vols. 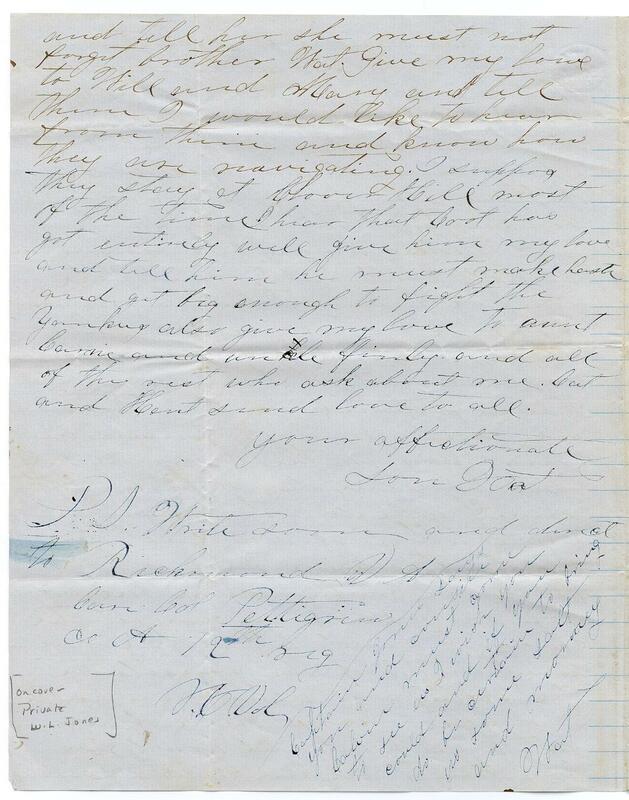 This entry was posted in Southern Historical Collection and tagged 22nd Regiment North Carolina Troops, Aquia Creek, Caldwell County, Edmund W. Jones, North Carolina, Walter L. Jones. Bookmark the permalink.